GEBRÜDER WILD COMPANY BEAD SAMPLE CARD, showing a wide range of Idar-Oberstein agate ornaments, including some rarely seen in the African trade. The top row displays talhakimt, turmrings and simulations of feline claws. Beads from Idar-Oberstein are easy to spot. Whether they are part of a Mauritanian headdress, prayer beads from Mecca or a strand from a West African market, they have a standard set of characteristics—striped dark brown, black or orange stones, cut in a variety of distinct shapes and made with great skill and precision. A German town of about thirty thousand people, Idar-Oberstein has been known throughout history as a place of stones, with local deposits of mostly low grade agate, jasper and other semiprecious stones. When it comes to bead history specifically, the town is almost synonymous with a wide array of agate beads that were traded to African and Arab countries. Though these stones were probably used since Roman times, the first documented proof of stonecutting in Idar-Oberstein dates from the fifteenth century. This was not a source of much income though. Due to economic hardship in the 1800s, growing numbers of Germans from this region settled in Brazil searching for opportunities. In 1827, a group of stonecutters from Idar who had settled in Brazil found local Brazilian agate deposits. The first shipment of rough stones arrived in Idar-Oberstein in 1834 and led to the very successful production and trade of Idar-Oberstein agates. STONECUTTER AT WORK. Stonecutting was hard work, abetted by having to lie down and push against the grindstone. Young workers risked a deformed chest. In general, the lifespan of the workers was short. Photograph from early 1900s. 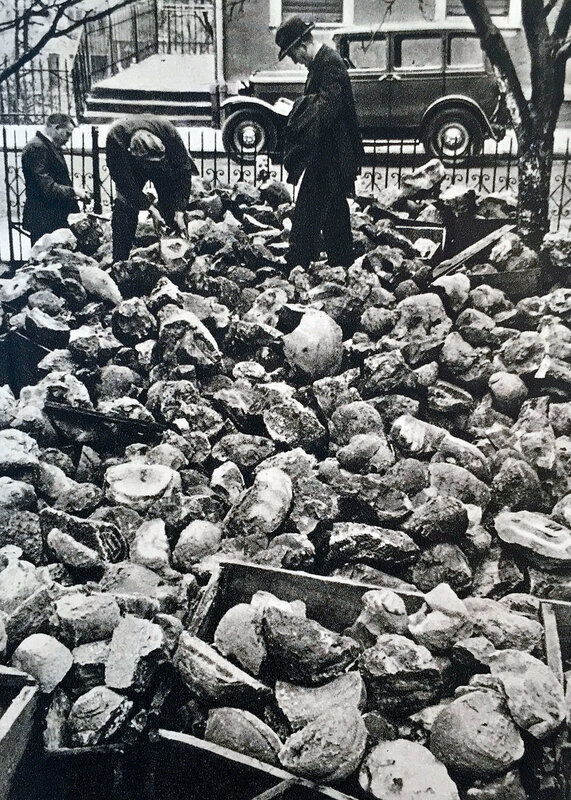 ROUGH BRAZILIAN AGATE STONE BOULDERS brought into Idar-Oberstein, from early 1900s. Photographs courtesy of Floor Kaspers. The rough stones from Brazil were auctioned in Idar-Oberstein. They were sorted, weighed and small pieces were cut off to show the natural color and banding. At first, a lot of the stones were cut and set in gold jewelry; later on, they were mostly made into loose agate objects, like beads and pendants for a foreign market. The agate from Brazil proved tough competition for the Indian agate. As a result, the agate trade from India slowed down and production and wealth in Idar-Oberstein grew quickly. NEWER PRODUCTION TALHAKIMTS, TALHATANAS AND TURMRINGS, IMPEXCO COMPANY. Germans call these turmrings, although English terminology distinguishes them as three types. The rounded “soft” edges indicate tumble polishing and therefore are newer pendants, dating from the 1960s. The traders brought examples of designs in agate to Cairo, even though it was not real carnelian; but the color was good, and so it was held in high regard (Spittler, 2002). In the second half of the twentieth century, the trade was more and more done by the Africans themselves. BEAD SAMPLE CARD FROM THE GEBRÜDER WILD COMPANY, of hand-polished talhakimt, with sharp edges, thus pre-1960s. The blue agate examples have not been seen in the African trade. Many of the bead merchants traded in a great variety of items, and they cooperated with other European beadmaking places. For example, they would let the people in Gablonz (Bohemia, now the Czech Republic) make glass copies of the agate beads. These copies were sent to Idar-Oberstein and traded together with the agate beads. Examples are the talhakimt pendants. Their design was patented by German cutters, and then the makers in Gablonz were given permission to make the same designs in glass. Since the 1980s, the demand for stone beads in Africa has declined. The coloring is what really set the beads apart from those coming from India. 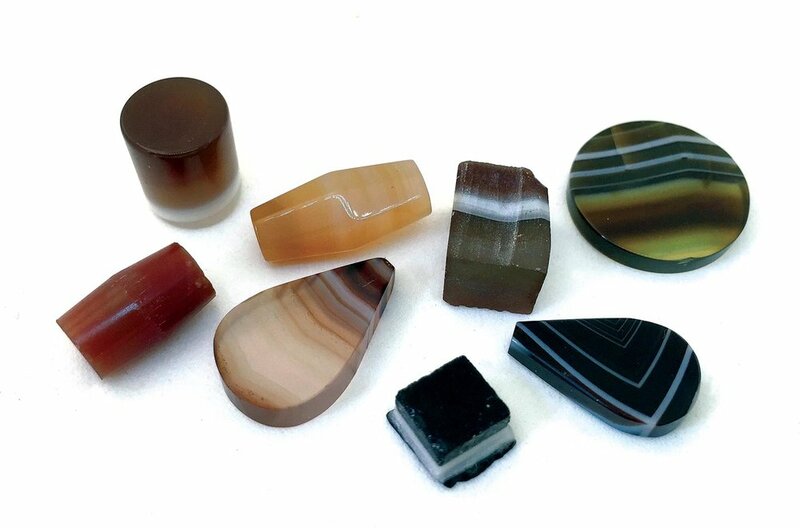 The rough material, agate, is a striped or banded version of chalcedony. In nature, different metals produce different colors, and the resulting agates are called sardonyx, chrysoprase, carnelian, or onyx, depending on their color. The people from Idar-Oberstein refer to the coloring techniques as brennen (heating or burning), färben (coloring or dyeing) and beitzen (often translated as staining, but a different, more permanent, technique). Different processes produce different colors. Most of these techniques were developed in Idar-Oberstein between 1813 and 1879 (Trebbin, 1985). The stones would be cut into smaller pieces, and these pieces were pre-cut into the basic shapes. For this first step, it was easier and cheaper to use a hammer and chisel to shape the stone, because grinding is more time-consuming. For big beads and other products, the stone was shaped directly on the wheel. Smaller pieces, like cabochons, would be stuck onto a wooden handle so they could be ground against the wheel. Idar-Oberstein cutters used large stone wheels that could be up to two meters wide and weigh up to three hundred kilos. Generally, two people would work on a wheel powered by a water mill. Some of the wheels had grooves to make specific shapes like round, oval and bicone roughs. Stonecutting was not an easy or a healthy profession. The cutters would lie on a wooden bench, pushing the stone against the wheel (Frazier, 1999). The final step on the wheels was the polishing which was done on beechwood cylinders, with earth as the abrasive agent. 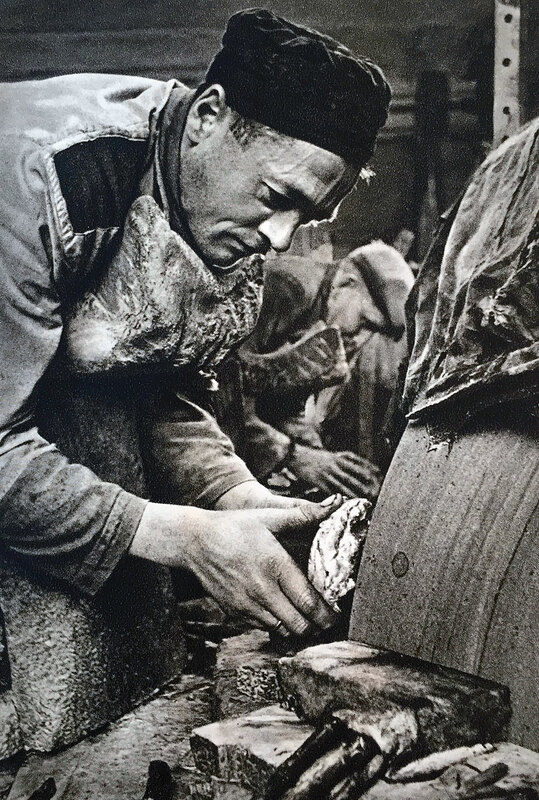 From the 1960s onwards, most of the polishing, especially on beads with simple shapes, was by tumbling. Instead of individually polishing the stone they were tumbled together, which is a much more efficient but a less precise process. It is also a way to distinguish the older beads from the newer ones. The beads with sharp edges are most likely made before 1960. 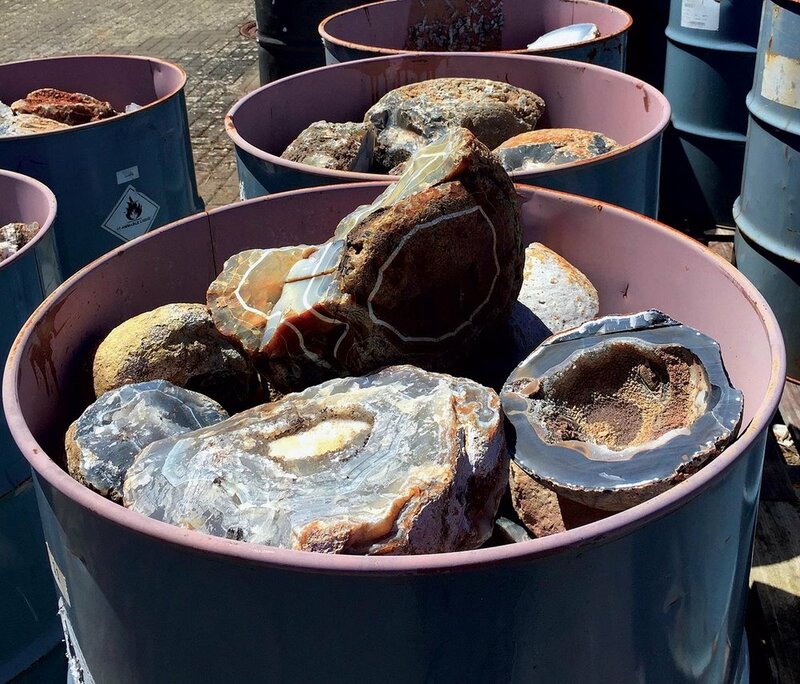 Left to right: BARREL OF ROUGH UNTREATED AGATE at the Impexco Company in Idar-Oberstein. HEATING A POTFUL OF AGATE BEAD ROUGHS on the stove, part of small scale treatment of agate to arrive at the orange/carnelian color, at the Impexco Company. UNTREATED AGATE with pieces core-drilled for bead blanks. Note the gray color versus that of the treated bead blanks in right-hand photograph. 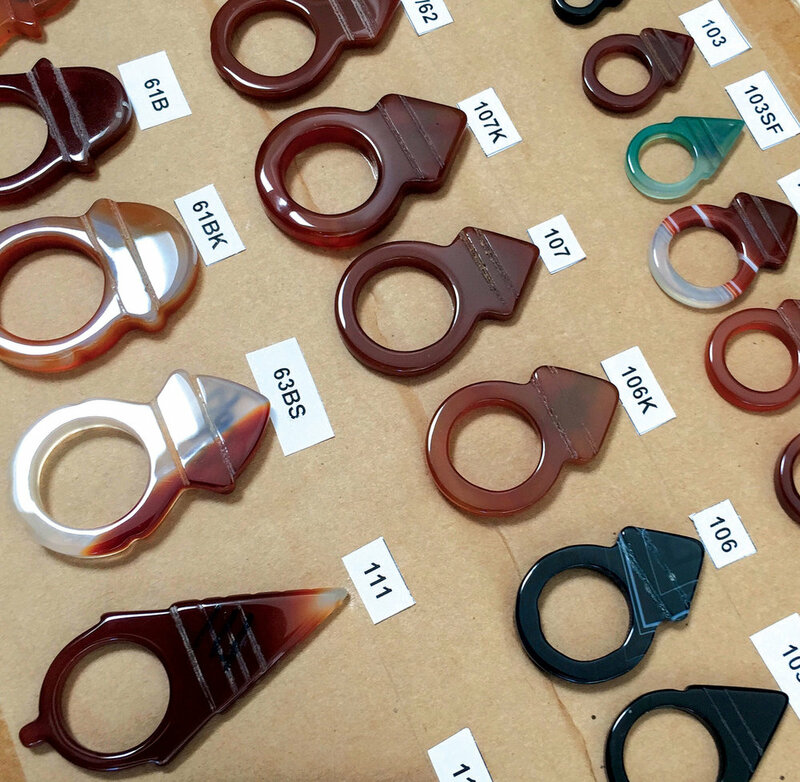 HALF-FINISHED BEAD BLANKS from Idar-Oberstein, ready to be drilled, cut or polished, already treated to reveal the intricate banding patterns. Courtesy of Floor Kaspers Collection. BULK STRAND OF AGATE TALHAKIMT PENDANTS, as well as other stone and glass beads from the African trade, from a West-African vendor at a recent African Art Village Show, Tucson, Arizona. These talhakimt appear to be pre-1960s, as indicated by the series of small cuts or nicks along their edges. The trade and production of agate beads in Idar-Oberstein took off once the companies discovered a Brazilian agate source. The skill of the craftsmen, the quality of the stone, the use of international trade routes, and adapting to the world market was how Idar-Oberstein became a very successful beadmaking town. Much help in the research of stone beadmaking in Idar-Oberstein has come from Harald and Julia Wild, Wolfgang Weinz and Wolfgang Kley. Support has come from the Bead Society of Los Angeles. Dalarozière, Marie-Françoise. 1994 Perles d’Afrique. Édisud, Aix-en-Provence, France. Dubin, Lois Sherr. 1987 The history of beads, from 30,000 BC to the present. Harry N. Abrams Inc, New York, USA. Francis, Peter Jr. 1994 Beads of the world, a collector’s guide with price reference. Schiffer Publishing, Atglen, USA. —2001 The stone bead industry of southern India. Beads, Volume 12-13. Frazier, Si. 1999 A history of gem beadmaking in Idar-Oberstein. Beads, Volume 10-11. Kaspers, Floor. 2016 Beads from Germany, Idar-Oberstein, Lauscha, Neugablonz. Marblings Publishing, Netherlands. Liu, Robert K. 1982 Amira Francoise: Living with beads in the Sudan. Ornament 5 (4): 24-27. — 1987 Imitators and Competitors, India, Idar-Oberstein and Czechoslovakia. Ornament 10 (4): 56-61. —1995 Collectible beads, A Universal Aesthetic. Ornament, Vista, USA. Spittler, Gerd. 1999 Der Weg des Achats zu den Tuareg-eine Reise um die halbe Welt. Geographische Rundschau, Jahrgang 54, Heft 10. Trebbin, C. 1985 Achate, geschliffen in Idar-Oberstein – Amulette, Schmuck und Zahlungsmittel in Afrika. Die Heimatfreunde Oberstein e.V., Idar-Oberstein. Wild, Julia. 2016 Afrikanisches Geld aus Idar-Oberstein. Simurg, Kulturzeitschrift, Heft 6. BEAD SAMPLES FROM THE GEBRÜDER WILD COMPANY traded to Mecca at the turn of twentieth century. Many were used in the Sudan, some repaired with silver caps when the ends broke (Liu 1982). 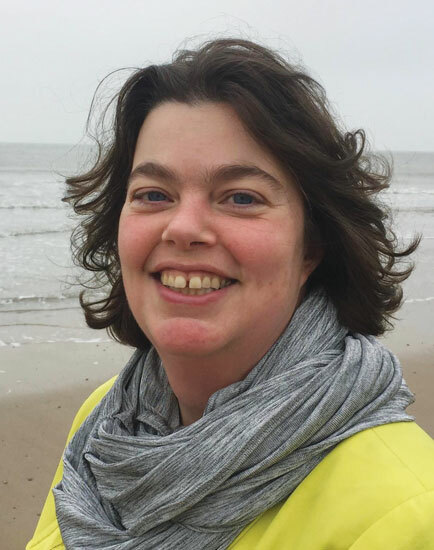 Floor Kaspers is an independent bead researcher and artist from the Netherlands. She has been exploring European bead history through her travels. By going to factories, old dump sites, shops and museums, she collects not just beads, but the stories connected to beads. After learning more about bead history, she also started making her own beadwork and glass art as a new way to explore the medium of beads and glass. Kaspers has written several books, including Beads from Germany which describes the development and production of beads in three German bead towns: Lauscha, Idar-Oberstein and Neugablonz. In the article on stone beads from Idar-Oberstein she explains the origin of the stones, the designs and the techniques of these typical agate trade beads. FOUR ANCIENT TABULAR/LENTICULAR HARD STONE BEADS FROM AFGHANISTAN AND TWO REPLICA AGATE BEADS; these carnelian and agate tabular beads are very similar to Mesopotamian third millennium beads, 2.8 - 3.5 centimeters long, 0.6 - 0.9 centimeters thick. Courtesy of Anahita Gallery and J. Lafortune, 1978. Two lowest beads are new replica tabular agate and leech beads from Iran and Cambay, 0.6 - 1.0 centimeters thick; Courtesy of W. Seifried, 2006 and Beadazzled/Kamol, 1999. Due to better lapidary equipment, especially drills, many replica beads are now thinner than the prototypes. Photographs by Robert K. Liu/Ornament; shot with studio strobes, using softboxes for both transillumination/reflected lighting or just reflective lighting when shooting on black Tufflock. Recently we relocated our office of the past twenty-six years into a much more manageable space. This entailed examining, sorting and discarding old files, as well as other material collected over forty-two years of publishing. While packing our study bead collections, I was struck again by the beauty of ancient hard stone beads, the lapidary skills of their makers, and how skilled contemporary stone beadmakers had become in producing imitations, replicas or their own designs. Such observations and insights are very similar to the pleasure of re-discovering books in your library that you have not read for years. Robert K. Liu is Coeditor of Ornament and for many years its in-house photographer. 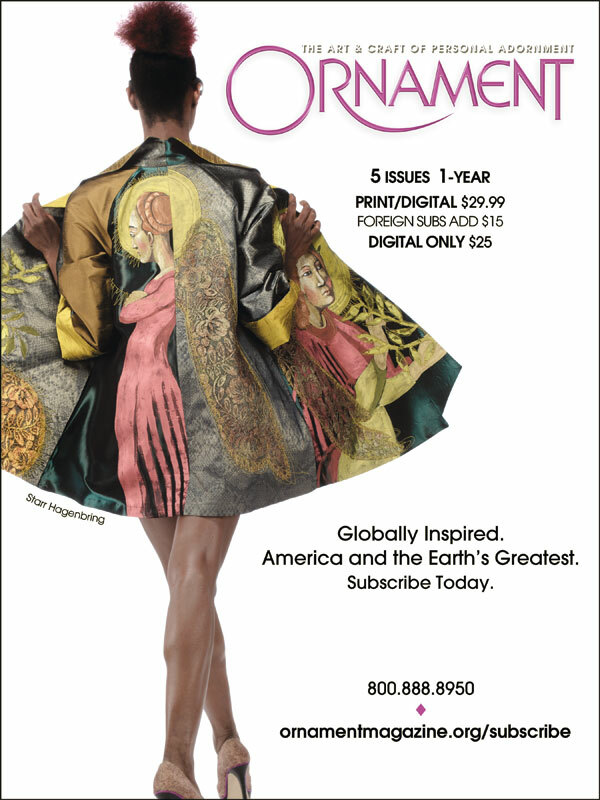 His recent book, The Photography of Personal Adornment, covers forty plus years of shooting jewelry, clothing and events related to wearable art, both in and out of the Ornament studio. In this issue Liu writes about the Ethnic Costume Museum in Beijing, which he visited with Carolyn and Patrick in 2013, on a return to China after sixty-seven years in the United States. While going through the recent move of the Ornament office, he restudied some ancient stone beads in its study bead collection, marveling at both the skill of ancient and contemporary stone beadmakers, especially those who did replicas or imitations. AQUA DOLCE NECKLACE of eighteen karat yellow gold set with natural surface and faceted aquamarines, 40.64 x 5.08 x .64 centimeters, 2010. Photographs by Pam Perugi Marraccini. On a mid-April morning Lee Marraccini is in his element, talking about his work in his shop, Angelo Jewelry, which he opened in 1998 in the old Michie Building on the downtown mall in Charlottesville, Virginia. Wearing gloves with their tips cut off, Marraccini shows off a ring featuring handcarved mother of pearl with eighteen karat gold and silver and diamond accents. The piece is stunning in its simplicity and depth—like the jewelry equivalent of Venus on a half shell. ANCIENT PEARL COLLECTION RING of eighteen karat yellow gold, fine silver and sterling silver with carved mother of pearl and inset diamond, 1.53 centimeters diameter, 2015. The ring is a part of Marraccini’s latest collection, which he has been developing over the past two years. The mother of pearl came from his wife, Pam Perugi Marraccini’s grandfather’s collection of materials. From Carrara, Italy, one of the marble centers of the world, stone sculptor Araldo Perugi came to America in the early 1900s. He worked on a number of projects in the northeast. One of the altars at St. Patrick’s Cathedral in New York City is inlaid with the same mother of pearl that forms the foundation for this new collection. Marraccini points to its unusual thickness: “The shell creature must have been really big,” he surmises. He discovered that he could carve into it and not lose the pearlescent quality of the surface. He has made bracelets, pendants and other ornaments from these remnants of Araldo’s altarwork. Turning to a set of chrysoprase earrings with sapphire accents, Marraccini points out how they have great movement. He carved the warm green mineral stone into matching ovals, setting them off in scroll frames. He prides himself on an exceptional ability to shape stones on a wheel. That special talent has led to jewelry that is warm, clean, linear—and playful. Marraccini has just returned from the American Craft Council show in St. Paul, Minnesota, which he feels is one of the most creative in the country. He enjoys meeting local artists from the greater St. Paul/Minneapolis area whom he does not see at other shows. “It’s good to see younger people coming back into the trade,” he states. EARRINGS of carved green chrysoprase with faceted blue sapphires and diamonds in hand-fabricated eighteen karat yellow gold, 5.33 x 1.78 centimeters, 2013. Looking at a bracelet from the Dolce collection in one of the cases in his shop, Marraccini lists the six natural stones in the line-up: aqua, peridot, amethyst, citrine, tourmaline, and garnet. The stones have been laid over mother of pearl. “You can see the juiciness of the piece—that’s why I call it dolce, it’s sweet like rock candy.” He notes that to create such a piece you need to have a level surface, but enough saturation of color. “It can’t be too translucent,” he explains. SPRING GOLD BRACELET of eighteen karat yellow gold with inlaid natural black jade and flushed set black and white diamonds, 16.51 x 1.27 x .64 centimeters, 1995. While recognizing that the work and travel that goes into participating in fairs may not always bear the financial rewards he seeks, Marraccini loves meeting up with close friends to talk art and business. These trips also double as scouting expeditions. His shop in Charlottesville carries the jewelry of more than twenty artists, offering a wide-ranging showcase of contemporary jewelry design from across the U.S. Featured jewelers include Belle Brooke, Reiko Ishiyama, Paul Morelli, Judith Neugebauer, Jayne Redman, Bree Richey, and David Urso. The work of several Charlottesville-area artists is also on display, including that of Tavia Brown and Gabriel Orfiesh. Marraccini’s wife Pam is director of Angelo Jewelry. Her photographs of Italy are hung on the walls. She made a living as a wedding photographer, but gave it up after developing shoulder issues. Since the arrival of grandchildren, the couple has limited their travels to going “where they are.” Daughter Marisa is a postdoctoral fellow in clinical psychology at the Warren Alpert Medical School of Brown University. Their son Marco works for an architecture firm in Culver City, California. Marraccini and his son collaborated on the MarcoLee collection. They were interested in trying 3-D printing. With Marco’s familiarity with the CAD design system, they were able to create a line of intricate and intriguing pieces. An eighteen karat yellow gold and oxidized sterling silver icosahedron pendant with turquoise and rubies brings to mind the designs of M.C. Escher. Marraccini uses a company in New Jersey to do the casting; “I send them the sketch, they send back the design; I tweak it and then they cast it.” The process is expensive, but to get someone to carve it in wax is becoming increasingly difficult. MARCO LEE COLLECTION ICOSAHEDRON PENDANT of oxidized sterling silver and eighteen karat yellow gold set with sleeping beauty turquoise and rubies, CAD designed and 3-D printed, 2.39 x 2.79 centimeters, 2012. A lot of Marraccini’s work remains hands-on, as a trip to his studio proves. Located in a line of brick buildings by the railroad track about a block or so behind his shop, the space is filled with the accoutrements of a full-blown jewelrymaking operation—benches, diamond saws, polishers, drawers of stones, stations for soldering and for other parts of the jewelrymaking process. On one table is an assortment of washers purchased from Hoover and Strong that Marraccini has incorporated into his work. In speaking about the jewelry business, Marraccini traces the ups and downs. He began to see the beginning of a downturn in 2000 when several of the stores that carried his work closed. At the time, he had a bustling studio with as many as nine people working for him, plus a couple of apprentices. A series of setbacks, including having his jewelry stolen while at a fair in Winter Park, Florida, led him to begin paring down his operation. Today, the team consists of Marraccini and Carol Rohmann Greene. He also lends space to jeweler Avery Groves who lives in nearby Afton, Virginia. While Marraccini misses his crew, which included an in-house caster, he continues to design like crazy, turning to a blackboard in the studio to work out new combinations. CAROL ROHMANN GREENE, Marraccini’s assistant, working at her bench. “I’m really passionate about the jewelry I’m making now,” Marraccini states, even as he acknowledges that the winds of commerce blow hot and cold. His store is doing well this year, which allows him to design more and continue to attend shows. He credits his wife with helping to turn the business around. He also does a “decent amount” of custom work and offers general repairs, resizing and laser welding, as well as inlay work. Marraccini graduated from Penn State in math education. He taught at the North Bethesda Junior High School. Not long after he married Pam, a third grade teacher, in 1972, she decided to take a class in pottery at an art studio in Washington, D.C. Wanting to accompany her through the dark city streets, Marraccini enrolled in the only other available class: jewelry. That is how he got started, learning the ropes from silversmith Dorothy K. Gordon, who specialized in hollowware. Marraccini considers his “main talent” to be “designing by parts.” Starting with sketches on the blackboard, he develops concepts for new pieces and watches them “metamorphose” through metal manipulation, fabrication, casting, and stone inlay. In 1973, the Marraccinis took off in their van, outfitting it with a bed and camp stove. “You would call us hippies now,” Marraccini notes, “but we didn’t consider ourselves that back then.” At one point they went to visit a friend in San Miguel de Allende in central Mexico and ended up staying for three months, taking courses at the Escuela de Bellas Artes, an art school housed in the cloister of a former convent. “For thirty-two dollars a month, you could take four full-time art classes,” Marraccini recalls. Having never attended art school, he signed up for jewelry, drawing, guitar, and ballet. “Why not?” he thought at the time. When things started to get a little crazy in Mexico, the pair returned to the East Coast. On their travels, they had met some friends who lived in West Virginia so they set up camp in Paw Paw, a small town located on a bend of the Potomac River “in the middle of nowhere.” They took up organic gardening and barely survived. BLACK & WHITE COLLECTION ELEMENTS of eighteen karat yellow gold and sterling silver set with natural black jade and mother of pearl inlay, ranging in size from .64 to 1.91 x .95 centimeters, 2006. It was at that point that Marraccini made his fateful decision: to figure out how to make jewelry that he wanted to make and that people would want to buy. He made a commitment to this vision, stuck with it, and began to gain traction. He launched Moondance Silver and began making the rounds of craft shows. Around this time, West Virginia was becoming “a little too wild.” Floods and harsh weather, along with isolation, inspired the pair to seek out a new place to set down roots. Pam suggested Charlottesville; they moved there in 1984. While much of his learning took place while residing in Paw Paw, Marraccini had some terrific teachers along the way, including Heikki Seppa, Ronald Hayes Pearson, Robert Ebendorf, and James Meyer. He learned rendering from Ivy Ross and advanced stone-setting from Alan Revere, the latter in San Francisco in 1986. LEE MARRACCINI AND PAM PERUGI MARRACCINI standing in front of their store, Angelo Jewelry. Marraccini considers his “main talent” to be “designing by parts.” Starting with sketches on the blackboard, he develops concepts for new pieces and watches them “metamorphose” through metal manipulation, fabrication, casting, and stone inlay. He combines gemstones, conflict-free diamonds and recycled gold in contemporary yet classic designs that have won him awards at craft shows. Charlottesville is a “sweet place,” Marraccini says, and he has developed a faithful following for his collections. He has been in the business for more than thirty-five years now; and although he is fond of quoting fellow jeweler Jacob Snow—“Setting stones in metal is a bad idea”—he has found a way to keep developing and to remain thrilled by the possibilities of the creative process. STACKING RINGS 80’S COLLECTION of eighteen karat yellow gold set with diamonds, inlays and faceted stones, 5.75 centimeters, 1985. ANCIENT PEARL COLLECTION EARRINGS of natural abalone shell, faceted blue sapphires, pink sapphires, and diamonds in hand-fabricated eighteen karat yellow gold, 3.2 centimeters diameter, 2014. 2.54 x 1.91 centimeters, 2009. On a visit with his daughter Emily and her family in Charlottesville, Virginia, in April, Carl Little paid a visit to Lee Marraccini at his shop and studio in the city’s pedestrian-friendly downtown center. Marraccini had just returned from an American Craft Council show in St. Paul, Minnesota. His belief that making jewelry should be “serious fun” for the wearer was evident in the work he shared during the interview. Little’s latest book, coauthored with his brother David, is Art of Acadia, which is being published to coincide with the one hundredth anniversary of the founding of Acadia National Park in Maine. Stones speak to Julie Shaw. Not in words, of course, but in signals and messages that are perfectly clear. The gunmetal gray hematite offers emotional protection because it repels negativity. Rose quartz stands for unconditional love and good will. Yellow-green citrine opens the heart to wonder and delight and is immune to ill will. Stones of nearly every kind have been the foundation of Shaw’s jewelry for more than forty years, and she describes her lifelong attraction to stones in spiritual terms. The other reason Shaw loves stones is that they are beautiful. Over the years she has used a treasure trove of quartz, opals, turquoise, moonstones, amethysts, lapis, coral, tourmaline, rubies, and virtually every precious and semiprecious stone you can name, and she uses them in relatively large sizes. One of her rings is typically one and a half inches across. A brooch could be up to four inches in length. A pendant might be four inches long and two inches wide. The stones that are the focal point of these pieces have nearly the same dimensions. She selects stones that throb with brilliant color, frequently designing two or three color saturated stones into a single ring or brooch. The compositions are framed in twenty-two karat gold and sterling silver, usually oxidized. The effect is invariably regal—these are head-turning pieces to be worn with self-confidence. They are also exuberant and joyful, a celebration of color and the natural world. Shaw’s long career as a professional artist could be a template for how to find fulfillment as an artist and support yourself at the same time. Born in Detroit in 1946, she was an artistic kid who took piano, ballet and art classes before attending the Detroit Society of Arts and Crafts, where she studied painting. After a year, she headed to London to meet up with an older sister living in Europe. Soon she was enrolled in the Sir John Cass Art School in London, studying ceramics. After eight months in London she packed up for Israel, where she lived on a kibbutz. Despite the military tensions and the Arab-Israeli War of 1967, she managed to hitch-hike through the Negev Desert. Shaw eventually returned to Michigan, where she rented a studio near a foundry, which inspired her to try sculpture. She also did some photography and built herself a darkroom. RING of sterling silver, faceted rose quartz from Brazil, and enamel, 2.54 x 2.54 centimeters, 2016. Photographs by Ryder Gledhill. Shaw took a soldering class and honed her skills making jewelry full time. Soon she was adding stones. The only other time she had made jewelry with stones was when she was twelve and had a volunteer job at the gift shop of the Cranbrook Institute of Science. Part of her job was to polish the rocks sold at the shop, and to select inventory from the vaults in the basement. She loved the work, and was paid in rocks. She got the idea to make pendants out of the rocks by attaching chains to them, and she talked the manager of the local dime store into displaying them for sale. She is still surprised they sold. RING of sterling silver, twenty-two karat gold, opal, and amethyst, 3.81 x 2.54 centimeters, 2015. In 2004 Shaw was lured to Paducah, Kentucky, by a generous civic program aimed at drawing artists into the community. Through the program she was able to buy a large, older home for very little money, as long as she agreed to fix it up and live there for a while. Which is exactly what she did. After supervising a major remodel, she spent the next ten years living in the home, where she also had her studio and ran a commercial gallery. “I called the gallery Aphrodite. It was a nice gallery, if I do say so myself. I sold my own work there, but also blown glass, ceramics, fiber art, and jewelry made by other artists.” It was also during her time in Paducah that she took up enameling. There were certain colors and finishes she wanted that she could not achieve with stones. So she took lessons from an enamel artist and started adding enamel to her jewelry. Today, six years after she seriously started experimenting with enameling, it has become integral to her work, and it has expanded her color palette. Her work is now a harmonious, colorful mix of stone and enamel, usually in the same piece. As a painter she was drawn to color, and enameling allows her to approach jewelry with a painter’s eye. NECKLACE of sterling silver, azurite druzy from Morocco, and enamel; pendant 8.89 x 2.54 centimeters, 2016. NECKLACE of sterling silver, dyed quartz druzy, and enamel, pendant 6.35 x 2.54 centimeters, 2016. NECKLACE of sterling silver, opal, chrysocolla druzy from Arizona, pearls and apatite beads, pendant 6.35 x 2.54 centimeters, 2015. BROOCH of sterling silver, acid-etched agate and enamel, 5.08 x 5.08 centimeters, 2015. Shaw’s work has sometimes touched on the narrative. After 9/11 she made jewelry showing flowers rising out of the flames of devastation. She has also made pieces in honor of Hindu gods whose spiritual qualities she admires. But her current work is abstract, despite its resemblance to brilliantly colored marine fauna. There are no heads or eyes on these creatures, though in a few brooches you might see the suggestion of tentacles or a dorsal fin. Robin Updike is a Seattle-based arts writer with a deep attachment to artist-made jewelry. As a former newspaper art critic she also has an interest in artists and the difficult choices they often face when it comes to their careers. For both reasons, she was pleased to have the opportunity to interview Julie Shaw, a jewelrymaker whose life as an artist is notable not only for the remarkable work she has made, but for the joyful, open-hearted way in which she has created a life wholly dedicated to art. In this issue Updike also reviews a handsome exhibition about indigo-dyed textiles at the Seattle Asian Art Museum. The exhibition is a serene reminder of why blue is such a primal color for us all.